K Balachander (more famous as KB) has been a maverick film-maker steadfastly refusing to conform to traditional norms laid down by the Tamil cine world. KB always believed that the script is the hero of a movie. This is the reason he seldom worked with stalwarts of Tamil cinema like MGR and Sivaji Ganesan. It is rather unfortunate that some of the most powerful performers in Tamil cinema were grossly underrated by the industry. These actors were over shadowed by these stalwarts. The names of Major Sunderrajan, Muthuraman, Nagesh and Jaishankar come to one’s mind when one recollects character artistes who rose above their roles in Tamil movies and made a difference. KB’s Ethir-Neechal remains an all time classic mainly because the movie was far far ahead of its time. The movie conveys a simple message in an endearing manner. Only KB could have taken the risk of engaging an actor (Nagesh) who was known only as a comedian until then and portray him as the hero. It was KB who gave splendid opportunities to Nagesh to shine as an actor par excellence in movies like “Ethir Neechal” (swimming against the tide), “Neerkumizhi” and “Server Sundaram”. Nagesh, a Kannadiga, earned his bread and butter from Tamil cinema and continued to remain loyal to Kollywood. Today he is remembered as a legend who gave heart rending performances in movies like “Ethir Neechal”, "Server Sundaram" and “Neerkumizhi” apart from the comic roles that he played with panache and élan. “Ethir Neechal” is the story of an orphan boy Madhu who lives below a stair case in a cramped chawl and runs errands for the residents of the chawl. Residents make use of him, take him for granted but pay him peanuts for his efforts or sometimes do not pay him at all. In return for the errands that he runs for the residents, Madhu carries a plate with him and the residents take turn to feed him. This is one of the poignant scenes in the movie and only Nagesh could have conveyed the emotions so superbly when he utters – “Madhu vandirikken” ( I am Madhu, I have come). Shame writ large on his face for having to literally beg for food but unable to control his hunger pangs, Nagesh’s stoic portrayal of Madhu is truly heart rending. are afraid of him. But Nair is one of the few who relates to Madhu. Or let us take the case of Sir (another awesome performance by the inimitable Major Sunderrajan) who becomes Madhu’s unofficial mentor. Sir is tough as nails, acerbic at times and blunt. But he also influences Madhu to a great extent. A bitter man, Sir, as Madhu fondly calls him, takes Madhu to task on most occasions but all his actions are directed at improving Madhu to transform him as a much more confident individual who gains mental strength to face the challenges of life. Sir’s sternness is merely a façade because underneath he has strong emotions for Madhu with whom he sympathises fully. In the most adverse circumstances, it is Sir and Nair who stand by Madhu. Madhu is also a part-time student and burns the midnight oil to pass in his exams so that he can land a decent job. Even when residents try to pull him down, Madhu never loses focus. He continues to work towards his goals and manages to get constant support from Nair and Sir. Once other residents accuse Madhu of stealing Nair’s watch but Sir stands resolutely by the side of Madhu. This is one classic scene in the movie where Nagesh and Major Sundarrajan try to outshine each other and render award winning performances. Even as life is as vapid as it can get for Madhu, in comes a new resident in the form of a young girl (the beauteous Kannada actress Jayanthi) who has just returned from a mental hospital. Her mother wants to marry her off quickly and tries desperately to hide her dark past but soon the secret is out. Residents treat the girl with contempt and at times even her mother’s caustic remarks unnerve her. Initially Madhu is scared and hesitant to talk to the girl like others but over a period of time, he empathises with her. Their friendship blossoms into love. As one incident after another unfurls, the movie reaches the climax where Madhu passes his exams with flying colours and lands a dream job. KB’s movie is about hope against despair, triumph against failure and love against hate. Caricatures like Pattu Mami (a bit of over acting by Sowcar Janaki) did offend the sensibilities of the Brahmin community in Tamil Nadu as Pattu Mami is shown as scheming, wily and unsympathetic. Pattu Mami is one of the residents in the chawl who constantly nags her husband (Srikanth) comparing her life with that of her neighbor’s. It is again to KB’s credit that he managed to rope in an actress like Sowcar Janaki (one of the leading ladies in Tamil cinema, at that point of time) to play a role like Pattu Mami that evidently had shades of grey., Jayanthi too delivers a fantastic performance as the girl who tries to pick the pieces of her shredded life after returning from the mental hospital. The redoubtable Nagesh’s performance as the underdog Madhu clearly stands out. One cannot imagine anyone else other than Nagesh essaying the titular role. This is one such KB movie that can be watched again and again. As a fan, you can have different interpretations of the movie at different points of time. Sadly, KB’s later movies (like Jadi Malli, Manadhil Uruthi Vendum, Nool veli, Agni sakshi - to name a few) turned out to be too preachy and collapsed at the box office. In KB’s crown, Ethir Neechal continues to be a jewel - something that none of his other films could match. Yes, there were other good KB movies that became immensely popular, but Ethir Neechal was special. Why? For once, the script was the hero. Second, KB portrayed a comedian as a full fledged hero and that too in a serious role. Third, the movie gives certain valuable lessons for all of us - Never give up, Strive against all odds, Forgive people, Believe in yourself. The movie also shows that it is so difficult to fight hunger in this world. This was one movie where all actors gave splendid, matchless and flawless performances. The sets closely resemble a Triplicane chawl and only KB could have managed a coup like this by shooting an entire movie in a set sans outdoors. Made on a shoe-string budget, the movie raked in huge profits for all its distributors who smiled all the way to the bank. It is to the credit of his directorial skills that there is not a minute of boredom as you watch this movie. Critics found the latter half a bit sagging compared to the crisp first half. The songs keep up with the pace of the narration and the flow and thus they do not prove to be interruptions. Ethir Neechal was originally scripted for the stage and later adapted for the silver screen. Dialogues have always been KB’s forte and Ethir Neechal is no exception. Let me share a little about Nagesh, the versatile actor, who ruled Tamil cinema for close to two decades until an off-the-cuff remark that he made about MGR led him to lose his market instantaneously. Ironically, it was MGR, who later lent him a helping hand to resurrect his dwindling career prospects. Credit goes to Kamal Haasan (who continues to be a great fan of Nagesh) for having given ample opportunities to Nagesh to perform in well-etched character roles during his twilight years. Nagesh’s personal life was marred by tragedies galore. When he wanted to share the news of his success with his mother, news reached him that his mother had died. Later, Nagesh’s wife was involved in a murder case. As if this was not enough, the brawl with MGR made him sink into oblivion as he took to drinks and movie offers eluded him. His finances were in a mess. To add insult to injury, one of his sons (Anand Babu, who also acted in a few Tamil movies and serials) became a drug addict. After a lot of persuasion, Nagesh agreed to write his autobiography – “Chirithu Vazha vendum” (Learn to laugh and live) that was serialized in a Tamil magazine. Towards his last years, Nagesh was fairly engaged as he acted in special roles that were created for him in Tamil cinema. He also got opportunities to act in TV serials. Actress K R Vijaya was at her peak when she was approached to play the role of the heroine in Server Sundaram with Nagesh. She did not hesitate to accept the role – she later had a rare opportunity to work with him in the Tamil TV serial “Appa Amma” (Father, Mother). All said and done, a man who made crores of Tamil cinegoers laugh with his trade mark humour, realized that true happiness continued to elude him until his death. Allegedly, only when he came out of his self imposed exile (thanks to his drinking habits), did life offer another chance to Nagesh and luckily he grabbed the offers that came his way. However, the heavy smoking and drinking took a heavy toll on his health. Coming back to the movie, “Ethir Neechal” taught the viewers to rise above all odds in life to win the battles and succeed. Swimming against the tide is so crucial for success in life. Perseverance and hard work are always rewarding. Problems are actually opportunities in disguise that propel an individual to explore his unutilized skills and talents. If our intentions are honest, we will find out supporters in this Universe to guide us. Readers, please note that this movie was made in the late 60’s, when it subtly portrayed the relation between Major Sundarrajan and Nagesh as a mentor and a mentee. Today we are all talking about mentorship and executive coaching, but it was KB’s ingenuity and creativity that made him talk about the same almost four decades ago. Do all of you agree? 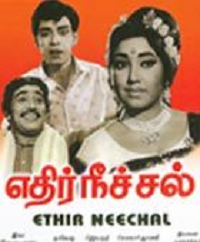 “Ethir Neechal” was made in the early 70’s in Hindi with Mehmood as the main protagonist. “Lakhon Mein Ek” where Mehmood played the role of Bhola had some good music – however Mehmood was nowhere close to Nagesh in terms of performance. But Mehmood did justice to the role in his own way and Radha Saluja agreed to work with him as his leading lady though she was an actress who had made a name for herself in commercial Bollywood flicks. Acting in this movie proved to be a blessing for the actress as she later got a once in a lifetime opportunity to work with MGR in his super hit movie – “Idhayakani”. There are certain nuances in the Tamil language that can never be captured when we translate scenes from a Tamil movie in another language. These nuances are unique to Tamil language and the Tamil culture. Despite the fact that Lakhon Mein Ek could not stand upto Ethir Neechal as a benchmark, it managed to create some awareness in Bollywood about Mehmood’s acting competence and potential as a serious actor. Do you still need proof that Ethir Neechal is truly a classic? So, what are you waiting for ? Grab a DVD and watch the movie again ! Real eye to see the reel world is necessary to value the art form. This is what exactly sir has done..Gave an insight into this old classic. Truly appreciable !! Venkatesh has simply outdone himself here. Its a wonderful piece of writing with fantastic observations and deep insight into human values and behaviour. I never observed or realised these points in this movie. I will definitely watch this movie again from the angles mentioned by Venkatesh. My God! why a great essay on 'Old Ethirneechal' with the picture of the new 'Ethir Neechal' which has no connection at all?